I’m the member of the eatinbrixton team that works and lives in Brixton. For nigh on 25 years I’ve broken up my working day, two or three times a week, by having lunch out in the town centre. Originally the decision was straightforward. The places I liked were the original pizza place pre-Franco Manca, Gyoza, or Ichiban Sushi and, in various guises, there was the Satay Bar. Now, of course, we are almost overwhelmed with good choices. From the favourites, Gyoza has just closed; Ichiban opens rarely for lunch and, while Franco Manca goes from strength to strength, I now find the calorie count too high except for an occasional treat. But the Satay Bar is still there and, despite the competition, it has now definitely become my favourite lunch spot. The food is seriously good; it’s comfortable with reasonable Wi-Fi to keep up with work. It is also great value for money. I’m just writing about lunch at the Satay Bar. Evenings when it becomes a serious nightspot are totally different. Not bad, just different – see our report on their cocktails here. 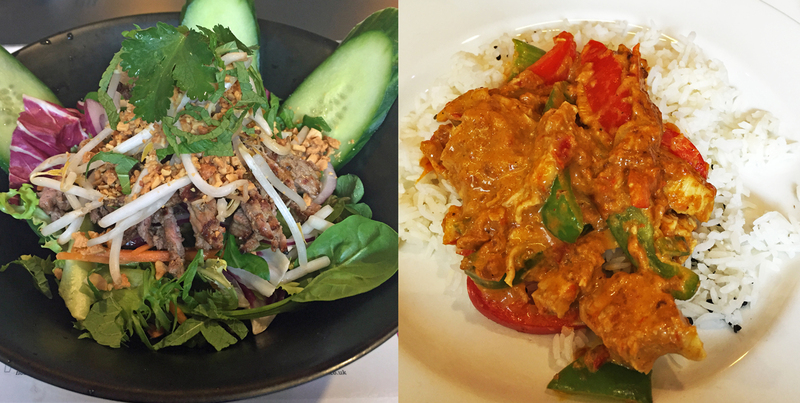 There’s a special lunchtime menu with all the south-east Asian favourites – see it here. 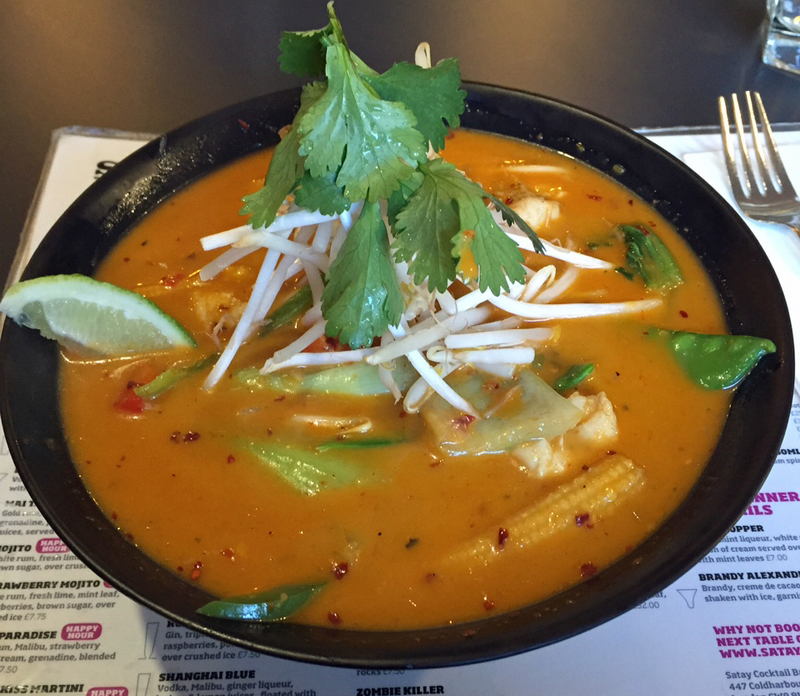 My top choice is the Laksa, a spicy coconut and noodle based soup, offering a large bowl of tangy broth containing the right amount of heat (two chilli symbol on the menu). I would happily have the laksa on each visit but I’m pleased to report that the Thai Beef Salad, (again two chillies) is also excellent. Another highly rated dish is the Chicken version of the Sambal Jawa, which is an Indonesian stir fry with coconut, coriander, lemon grass, vegetables, sambal ulek and other spices. My only disappointment is Big Belly Phad Thai that I found a bit claggy. 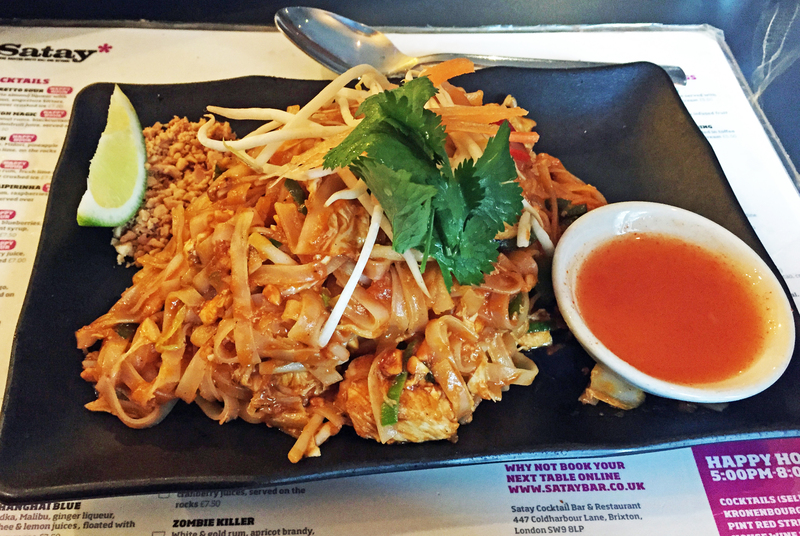 Maybe I hit a bad day but there are other places in Brixton where Phad Thai addicts can do better. So I can strongly recommend the Satay Bar as the top choice for a good value lunch. I tend to drink tap water so the bill comes in at less than £10 for a substantial meal. Another notable distinction is the clientele. At lunchtime, but even more at night, the majority of the other customers have been black. I have often seen comments pointing out how white the diners are in most of the eating places in Brixton Village but the opposite is the case here. There is nothing about the food that explains the sharp difference in clientele – except the fact that they are discerning about good quality food.